on PBS episode of America's Heartland! 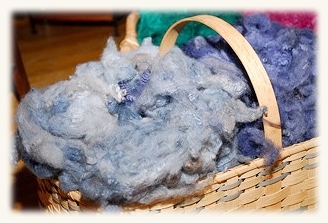 Sweet Home Spun is a spinning and knitting studio on a working sheep farm in Henry County Kentucky. JoAnn Adams, a lifetime knitter and longtime spinner, knits, spins and gives classes in the Historic Six Mile Meetinghouse on Sweet Home Farm. Sam and Samuel Adams care for the gentle flock of natural colored long wool sheep. Sam and JoAnn moved to the family farm in 1979. They are dedicated to preserving the agricultural and historic heritage of their land. JoAnn’s love of knitting and spinning wool led the family to raise sheep in the gently rolling pastures around the house. 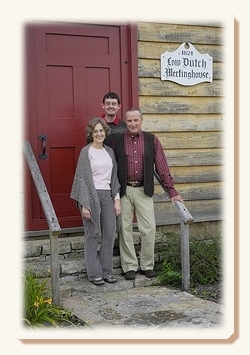 In 2004, the family acquired the original timbers of the historic "Six Mile Meetinghouse." Sam directed the reconstruction of the Meetinghouse in collaboration with the Kentucky Trust for Historic Preservation. Thanks to the craftsmanship of Bryant Burke of “Burke’s Woodworks” the Meetinghouse stands as a tribute to the Dutch Colony that settled the region. Today’s visitors can experience traditional craft in an historic setting. 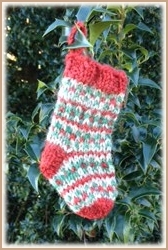 JoAnn offers spinning and knitting lessons and a variety of spinning and knitting accessories. Shoppers enjoy browsing through JoAnn’s creations along with craft and fiber from other Kentucky producers. The Meetinghouse is open most evenings and week-ends. Visitors should call or email to arrange a visit or to schedule a lesson.